​Badlands all to yourself in unusual shapes and colors. With a little looking you can find some dinosaur gizzard stones called gastroliths and there is some attractive chalcedony. 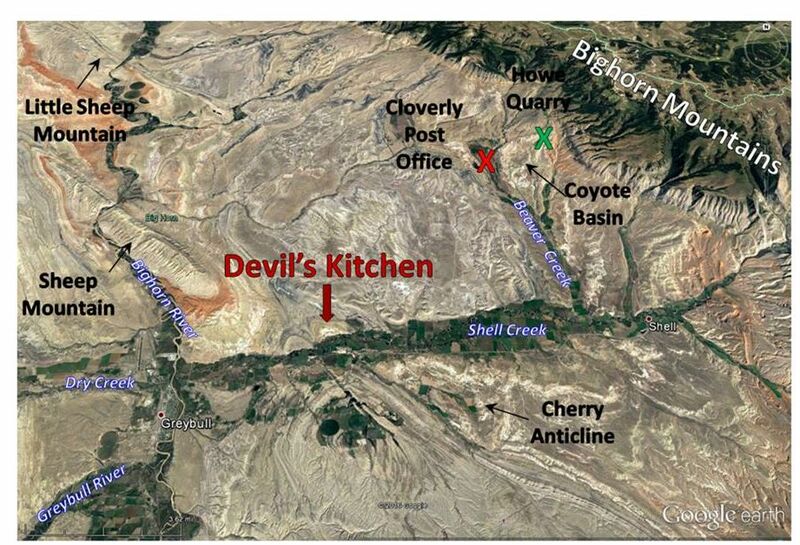 Devil’s Kitchen is a 115 acre geologic feature located five miles east of Greybull, Wyoming. While only a short distance from town, visitors may feel they have traveled to an alien world. The “Starship Troopers” movie of 1997 used a similar badlands for a film location of its alien world (Hell’s Half Acre, Natrona, County, WY). Steep slopes and ravines, rock towers and eerie shapes of multiple colors meet the eye in all directions. The area displays a classic example of badlands topography. The word “badlands” was probably first used in the Lakota phrase “mako sica” (“land bad”) for this type of rugged land in South Dakota (now Badlands National Park.) 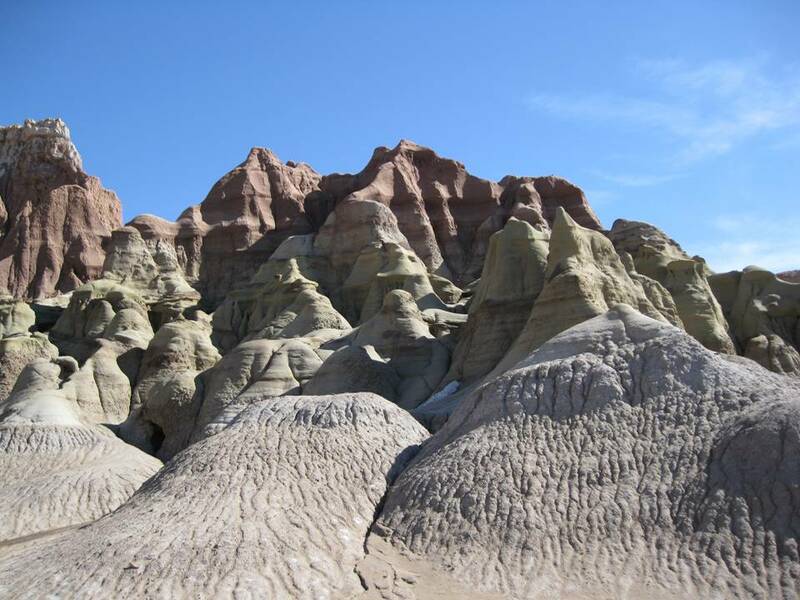 French fur trappers used the phrase “les mauvais terres pour traverse” (“bad lands to travel through”) to describe badlands topography. Several features characterize this landform, including layered, soft sedimentary rocks of sandstone, shale and claystone. It has very limited vegetation with little soil development, and arid to semiarid climate with intermittent rainstorms. The elevation is generally above the local water table, enabling flash runoff and erosion during storm events. North view of Devil’s Kitchen area. The locations of the Cloverly Post Office (red “X”) and the original Howe Dinosaur Quarry (green “X”) are shown. The Devil’s Kitchen structure is an asymmetric anticline with Early Cretaceous Cloverly Formation exposed within the core. An anticline is folded rock in the shape of an umbrella or an upside down ship hull. At Devils' Kitchen, the top of the umbrella shape is eroded off so it resembles a cut onion. The Cloverly Formation was first recognized by N.H. Darton during reconnaissance mapping in 1904. The formation was named for the Cloverly Post Office that was located 9.5 miles northeast near the type section outcrop. Devil’s Kitchen was originally known by the less dramatic name of Shell Dome, but tourist attractions need a name that is hot and spicy. Charles Lupton mapped the structure at the top of the “Greybull Sandstone” in 1917 for the United States Geological Survey. 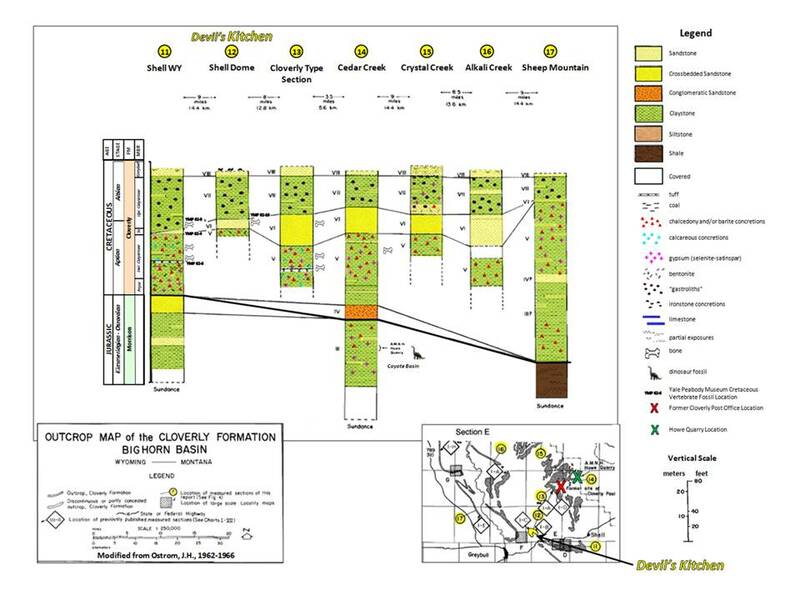 The Wyoming Geological Survey issued a quadrangle map in 1986 that originated from Reppe’s 1981 graduate work at Iowa State University. Lupton Shell Dome Area Cloverly Structure Map. Devil’s Kitchen location (Ne 31-53N-92W) shown by exposed Cloverly Formation: yellow fill. 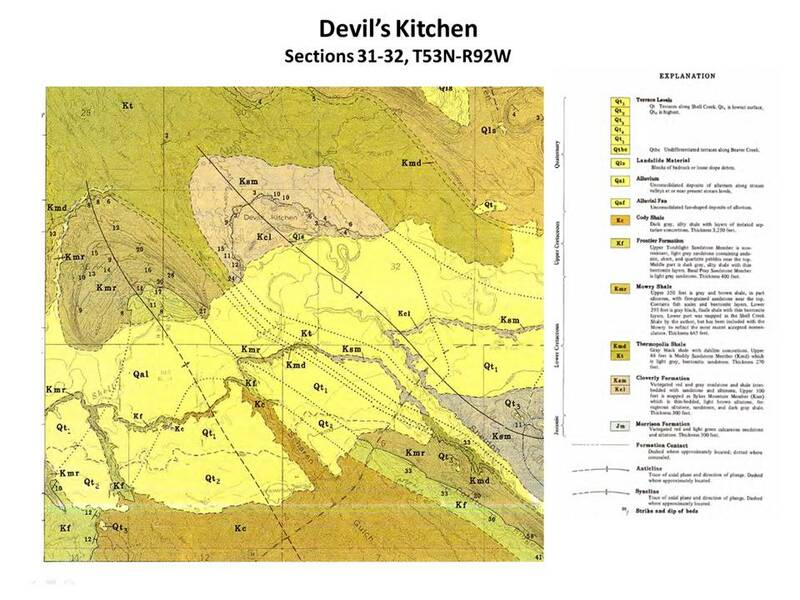 Geologic map of Devil’s Kitchen. Shell Creek Dome is in the center of the image with Cloverly Formation (Kcl) exposed along the structural axis and showing asymmetry to the southwest. The Sykes Mountain Member (Ksm) is equivalent to Ostrom’s Unit VIII and the Greybull Sandstone Member of the U.S. Geological Survey. Syncline to the left has Frontier Formation at its core (Kf). Regional Cloverly – Morrison cross section in the Greybull – Shell, Wyoming area. The Cloverly Formation was deposited above the Jurassic Morrison river system and underlies the marine Thermopolis Shale. The U.S. Geological Survey divides the formation into three parts: 1) a basal conglomerate or conglomeratic river sandstone known as the Pryor or Lakota member depending on the location; 2) the middle section includes multicolored upper and lower shale or claystone floodplain units separated by a sandstone bed; and 3) the uppermost member includes the Greybull Sandstone with the “Rusty Beds” on top. The upper claystone of the middle unit contains abundant dinosaur gizzard stones (gastroliths) while the lower claystone portion contains concretions of chalcedony, barite and carbonate. The lower and middle Cloverly sediments were deposited within a terrestrial river system. The uppermost unit documents the initial Cretaceous sea level rise of the Western Interior Seaway. The Greybull sands were deposited in paleo-valleys by streams or estuaries during sea level drops.. The “Rusty Beds” mark tidal flats on the Cretaceous Seaway. The Cloverly has produced about 2 percent of the oil and 5 percent of the gas recovered in the Bighorn Basin. The Shell Dome was unsuccessfully tested by three wildcat wells drilled between 1915 and 1967. The Mississippian Madison Formation was the oldest formation penetrated. Gerd Jager has posted a series of excellent images of Devil’s Kitchen on Forum Discover America at http://www.usa-travelcenter.de/discoveramerica/wbb/wbb2/index.php?page=Thread&threadID=17393. Theodore Roosevelt (1858–1919), “A Book-Lover’s Holidays in the Open,” 1916, Forward, p. x. At Devil’s Kitchen, there are bluffs and outcrops of sandstone and claystone in unusual shapes and colors. You can see gastroliths that are gizzard stones from dinosaurs. There is a layer with hand specimen size chalcedony (microcrystalline quartz) that is attractive. ​There are a couple of dry hole markers for old exploration wells. When exploration wells are drilled, steel pipe is set in the shallow part of the hole to protect it from collapse and protect shallow aquifers from contamination. Unsuccessful wells such as these are usually plugged with cement set in the open hole and in the pipe. The pipe is cutoff just below the surface and a dry hole marker is welded onto the pipe. What you see today is a steel pipe marker about three feet high with the location and name of the well welded into the pipe. The Shrake McKown well was the deepest of these wells and had a total depth of 2,494 feet in the Madison Formation. These wells were drilling a geologic structure called an anticline. Similar structures produce around the basin. At Devil’s Kitchen you can see dip of the beds in three directions (west, north and east) away from the central area where the wells were drilled. What is uncertain from surface geology is if there is dip to the south where Shell Creek has eroded away the beds. These wells were possibly unsuccessful because there is no south dip to hold the oil in the structure. Another explanation is oil did not migrate into this structure. Devil’s Kitchen is accessible with a passenger car. However, the unpaved roads are not recommended when wet as they become a quagmire. Driving time out to the site from Greybull takes about twenty minutes. It is a fairly compact site on federal land that you can hike in an hour or two. There is not much elevation change, but it is certainly not flat. There is a short very steep slope into the basin from the parking area. Private land is located on the south end of the site near Shell Creek. Starting at the only traffic light in downtown Greybull at the intersection of US 14 and US 16-20, head east on US 14 toward Shell and Burgess Junction, 0.2 miles Greybull Museum on right has an impressive giant ammonite that was found in the county (4 foot diameter, 960 lbs), 0.4 miles bridge over Bighorn River, 0.5 miles Greybull Oil Field on right that used an innovative oil mining operation where a long sloping tunnel was driven under the field with multiple holes drilled upward from the tunnel into the field for gravity oil drainage (it probably wins for most unusual way to develop an oil field!) this link has multiple pictures of the tunnel installation http://www.dsiunderground.com/projects/project-details/article/greybull-petroleum-usa.html, 6.8 miles old Shell schoolhouse on left, 7.3 miles turn left on Davis Road for Devil’s Kitchen, 7.5 miles cross Shell Creek, 8.5 miles turn left on Big Horn County L33, 10.9 miles turn left on dirt road, 12.2 miles arrive at Devil’s Kitchen. Directions from Greybull to Devil’s Kitchen geologic site.